Our farm is audited and inspected by a third party non-profit organization dedicated to improving the lives of farm animals to ensure we are following all of their standards and meeting the highest expectations for humane animal care. The Country Hen Farm is Certified Humane® by the Humane Farm Animal Care. Humane Farm Animal Care is the leading non-profit certification organization dedicated to improving the lives of farm animals in food production. 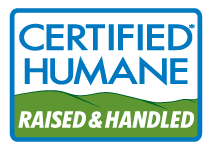 When you see the Certified Humane Raised and Handled® label on our eggs you can be assured that they have come from our farms that meet precise, objective standards for farm animal treatment. For our barns and farms, that means that the hens are cage free with ample room to move about the barns, are fed a healthy diet free of added hormones or antibiotics, and that we handle them gently. • The producer meets HFAC’s Animal Care Standards and applies them to animals, from birth through slaughter. • Animals are never kept in cages, crates, or tie stalls. Animals must be free to do what comes naturally. For example, chickens must be able to flap their wings and dust-bathe, and pigs must have the space to move around and root. • Animals must have ample space, shelter and gentle handling to limit stress. • Animals must have ample fresh water and are fed a healthy diet of quality feed, without animal by-products, added antibiotics or hormones. • Producers must comply with food safety and environmental regulations. Processors must comply with the American Meat Institute Standards (AMI), written by Dr. Temple Grandin, a member of the HFAC Scientific Committee.